I recently bought an AvX gravity feed from my local comic shop, in hopes of coming a little closer to finishing my set of AvX. I still needed 9 rares and 2 super rares (Green Goblin and Wolverine). My comic shop was able to get one in for me. I worked a little overtime this paycheck, and figured, what the heck, this will be my last chance to get the AvX super rares I was missing. Usually, on a given Wednesday when I make my regular comic book purchases, I will buy 2 booster packs of Dice Masters. My 3 year old daughter will open one pack, and my 2 year old son will open the other. These same 2 children will pull my binder of Dice Masters cards out of my bag, and start flipping through the pages, naming every character they see. It always starts off the same way, “Beast, Beast, Beast! Captain America, Captain America, Captain America! Hulk, Hulk, Hulk!” Etc. They get excited when they open boosters and pull characters they recognize, and I get excited when they pull my favorite characters (even if I already have them), and it’s a fun way to explain random comic book facts to my kids. One time, my daughter opened a pack with Black Panther, and another character that she didn’t recognize. Maybe Kitty Pryde, I don’t remember. While my son opened one with Storm. My daughter wasn’t happy because SHE wanted to get Storm, because Storm is HER favorite X-Man. I got to tell her all about Black Panther and how he married Storm. She smiled. 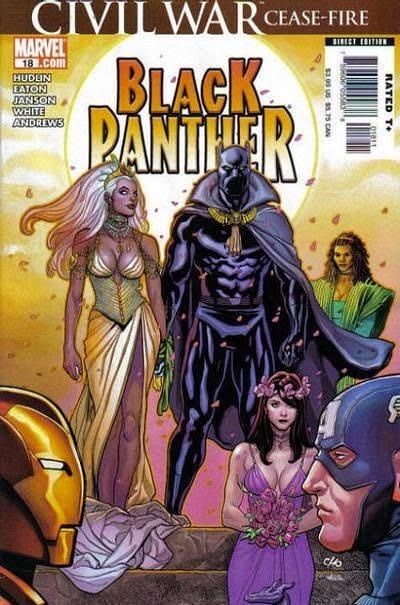 So I went and dug out my issue of Black Panther (one of the only Black Panther comics I own) where he and Storm were married. I was able to sit down and read my daughter that comic. Now she likes Black Panther… not as much as Storm, but now, “That’s Black Panther. He married Storm!” every time she sees him. Sigh, I digress… I brought home my AvX gravity feed and was going to blow through it with my son and daughter. My daughter was disinterested all of the sudden. She opened up one pack with me and then wanted to watch TV. It was right before bed time, I don’t really blame her. However, my son was as eager as ever. And now that his sister wasn’t opening them too, he would help me open the remaining 59 packs all on his own. So, for 59 booster packs I started to tear it open, handed it to him, he opened it the rest of the way, he handed it back to me to pull the dice and cards out, then I handed him the cards so he could tell me who we got. It took a while, but we had a blast. The results however…. Not so good. No super rares, and only 2 rares that I didn’t have before. I pulled a bunch of rares I already had, so at least I have some trade bait to hunt down the rest of the rares… but no super rares. Ugh. Well, at least I had the upcoming AvX Rainbow Draft as a last chance. So, the weekend of the Month 6 Event. My wife was going out of town for the weekend, leaving me with all 3 children (my 3<sup>rd</sup> child is just under a year old) for the first. Time. Ever. As daunting as that may seem, Saturday went off without a hitch. We stayed busy, went Christmas shopping, and by the time we got home, everyone was tuckered out and went to bed. Then I stayed up to enjoy some college football. (Go Buckeyes. O-H!) Even thoughmy wifewas out of town, I had babysitting lined up for the Dice Mastersevent on Sunday afternoon. My parents would watch the 2 oldest, and a separate babysitter would take the baby and also pick my wife up from the airport. Normally, I wouldn’t go to all this trouble just to play Dice Masters, but Cyclops is my favorite comic book character (currently. My top 5 characters are constantly moving and jockeying for position, but right now Cyclops tops that list based on his current role in the Uncanny X-Men comic book spinning out of the aftermath of the AvX event). 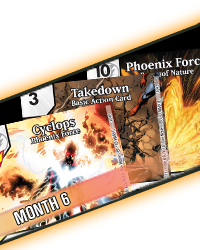 Also, I was poised to win a copy of the Phoenix Force card and die for the entire 6 month event. Saturday night around 2:30 am, my son, the 2 year old, my Dice Masters booster opening buddy, woke up crying. I went in a put my hand on him telling him it’s ok, and to go back to sleep. Wet. And chunky. Oh no… He had gotten sick. After cleaning the bed, changing his clothes, and spraying things with Lysol, he went back to bed and didn’t get sick again the rest of the night. Ok, it was a fluke, something just didn’t sit right in his stomach, he’s not sick, I can still go to my Rainbow Draft, as long as he isn’t acting sick. Shortly after waking up, you guessed it, sick again. Well, $%#&. So, I text parents, babysitter, wife, and everyone else involved in the day’s plans and let them know what’s up. I stayed home with all 3 kids the rest of the day, taking care of my sick 2 year old. It wasn’t what I had planned. So yea… this guy. This guy, my little Dice Masters buddy. 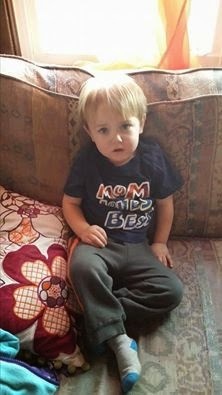 Oh well, I obviously wasn’t going to go play my game when all he wanted was to sit on the couch with me and watch Star Wars, Max and Ruby, Frosty the Snowman, and whatever else we watched that day. All things considered, I survived the weekend taking care of all 3 kids while my wife was out of town. More importantly, the children survived. Turns out my son just had some kind of 24-hour flu bug, and by Monday morning he was back to normal. The event organizer gave me a call Sunday night, and it turns out I still did well enough, even with missing the last event, to get the Phoenix Force card and die. So, it looks like my AvX set is as complete as it’s going to get, shy of some trading, and I need to hunt down a Cyclops Phoenix Force card. Kids will always, ALWAYS get in the way of things you want to do. You can plan all you want, but at the end of the day you have to be willing to drop everything for them. Even Rainbow Drafts and Cyclops cards. I’ll take the trade off. So that’s my “AvX Month 6 EventReview”. I hope you enjoyed reading it more than I had living it. I’m honestly too exhausted to think of a clever way to end this. Roll on.